The global geographic information system (GIS) market was valued at USD 6.3 billion in 2017 and is further expected to become USD 12.7 billion by 2024. This market is further expected to witness CAGR of 10.7% during the forecast period 2018 – 2024. The increasing popularity of this market is attributed towards extensive utilization of GIS by several business organizations to develop maps that help in efficiently performing analysis, solving complex problems, sharing information and communicating across the globe. This system is further enabling the organization to perform this task in an effective manner. The GIS market on the basis of the component is segmented into hardware, software, and services. Among all these components, the software segment holds the largest share is expected to witness a CAGR of 9.2% during the forecast period. Software-based GIS is extensively being used in spatial data analysis, spatial data processing, spatial database management systems, and digital mapping. Moreover, the services segment is expected to observe increasing demand pertaining to excessive utilization for spatial data analytics in several applications such as taxi aggregators, urban planning and food delivery. On the basis of project size, the GIS market is categorized into small medium and large projects. Among these, medium size projects are the most commonly executed due to the involvement of governments in developing as well as developed countries. On the basis of application, the global GIS market is segmented into water & wastewater, government, aerospace & defense, oil & gas exploration, engineering & business services, oil & gas refining, healthcare, transportation & logistics, telecommunications, and others. Engineering and business services segment is expected to witness the highest CAGR of 11.9% during the forecast period. Due to rapid growth in urbanization, it is expected to further enhance the developmental activities in the construction and infrastructure sector. The massive usage of GIS technique in the analysis of urban planning such as use value of the land is further enhancing the growth of the market. Moreover, extensive implementation of positioning technique in transport and logistics is expected to further increase the demand for GIS in the global market. Furthermore, in agriculture, the technology is adopted in order to ensure and enhance the effectiveness and efficiency of farming methods. The increasing amalgamation of GIS system with traditional technology has upgraded the business intelligence systems of the organization. Furthermore, the combination of IoT devices and GIS system helps the users in accessing accurate data along with using geospatial data analysis. Moreover, the increasing demand for location-based services such as control of a valve and real-time status is driving the growth of the GIS market across the globe. Additionally, the increasing usage of GIS systems in the construction sector is expected to further exaggerate the growth of this market during the forecast period. Due to the exponential increase in geospatial information has further resulted in the extensive adoption of these systems in several business organizations across various application areas such as advertisement and marketing division. It has been observed that the GIS application is the major beneficiary of the easily accessible geospatial data. 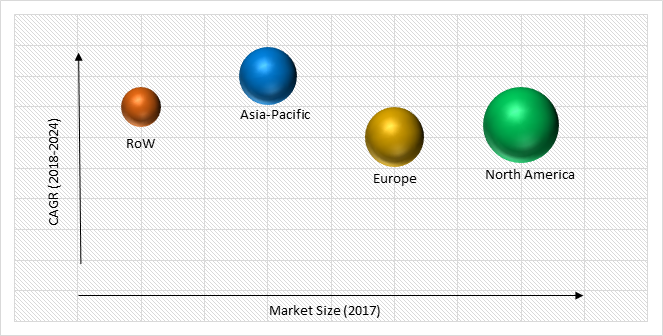 Moreover, expanding the number of mobile device users and other technologies and SaaS-based cloud-computing are the major factors that are the growth of GIS market across the globe. The initial high set up cost of the GIS system and non-existence of authentic spatial data is the major factor hindering the growth of this market across the globe. Moreover, it has been observed that an ample amount of capital is required for developing a database and managing the overall GIS system. As a result, small and medium enterprises and government of emerging economies are not implementing GIS technique which is further restraining the growth of the GIS market. Globally industry players are leveraging market growth through extensive application of GIS in various fields. Several key industry players are providing state-of-the-art software applications to its users that are further bolstering the growth of the GIS market. Geographically, Asia-Pacific is expected to witness the fastest growth of 11.9% during the forecast period. The growth of this market in this region is attributed towards increasing implementation of the geospatial system by the business organizations in several sectors such as agriculture, mining and manufacturing, construction and insurance sectors that are enabling them to undertake informed decisions and identify potential strengths of their organization. Moreover, it has been observed that geospatial technologies are extensively being used for agricultural and rural development in this region. Furthermore, excessive usage of mapping and surveying technologies are driving the growth of the GIS market in this region. Moreover, the implementation of the GIS system in various countries such as India and China are expected to further drive the growth of this market during the forecast period. Some of the major players operating in the global GIS industry include Environmental Systems Research Institute Inc. (Esri), Macdonald & Company, Pitney Bowes Inc., Dettwiler and Associates Ltd., PASCO CORPORATION, SuperMap Software Co. Ltd., Ubisense Group Plc., Bentley Systems Incorporated, Schneider Electric SE and Autodesk Inc.
10.1. Environmental Systems Research Institute Inc.
10.4. Dettwiler and Associates Ltd.
Table 134 Snapshot – Environmental Systems Research Institute Inc.
Table 136 Snapshot – Pitney Bowes Inc.
Table 137 Snapshot – Dettwiler and Associates Ltd.
Table 139 Snapshot – Ubisense Group Plc. Table 142 Snapshot – Autodesk Inc.